Beer pong is a fun and exciting drinking game that is now played by people of all ages, including College students, and even adults having a barbeque. To truly enjoy the game, you need to have a series of accessories that make the game possible without issues – and the best ping pong balls for beer pong should certainly be on your list of must-have items. While you can get away with using different types of balls, there are some specialty beer pong balls on the market that will greatly enhance your experience while playing this exciting drinking game with your friends. We’ve researched and discovered the seven top-rated ping pong balls for beer pong, as well as the worst one to avoid. What is the difference between 1-star and 3-star ping pong balls? Do ping pong balls come in different sizes? The best ping pong balls for beer pong of 2019, when price, quality, and size are all considered, would be the GoPong Official Beer Pong Balls. These balls are manufactured by a brand that is relatively well-known in the ping pong industry, and this particular pack was designed specifically to be used in beer pong. The balls are made to be sized appropriately according to the official rules that are often followed by people who enjoy playing beer pong. Each beer pong ball is 40mm in size and features a seamless design. The GoPong Official Beer Pong Balls package comes with a total of 36 balls in a single package and will only set you back $12.99. Since these balls are created from a single construction process, there is a much better bounce while the balls are used in a beer pong game. If you are looking for the best table tennis balls for beer pong, then you should take a look at the KEVENZ 3 Star Table Tennis Balls package. This pack comes with standard 40mm balls that are appropriate for both table tennis games and your beer pong nights. All balls are white in color, but you are able to select orange balls if you rather prefer them, which can be a good choice in cases where you are playing beer pong on a lightly colored surface. The MAPOL White 3 Star Premium Table Tennis Balls pack is also a good option if you are looking to buy a set of standard table tennis balls to be used in your beer pong games. This package includes a total of 50 balls, and they are all three-star balls, adding extra durability so that you can continue to use them for extended periods of time without having to worry about the balls cracking or breaking. The balls were designed to provide an improved bounce for your games as well. One thing that makes the MAPOL White 3 Star Premium Table Tennis Balls package very unique is the fact that the manufacturer of this set offers customers a 30-day money-back guarantee. If you find that the balls are breaking or they are not to your satisfaction, you can get a 100% refund on your purchase. If you are looking for a smaller pack of balls, then consider the Franklin Sports 1 Star Table Tennis Balls. These are general-purpose table tennis balls, but they will be perfectly appropriate for your beer pong as well. This package includes a total of 18 one-star balls, which means the balls are not of exceptional quality as some of the other options, but they have been designed to provide improved bounce and control. They are also made to be used for an extended period of time due to the inclusion of durable materials in the construction of the balls. In addition to the 18-pack, you can also select a 36-pack and a 144-pack if you prefer to buy more of these balls at once. If you are on a low budget and would like to add some color to your beer pong operation, then take a look at the TADICK Beer Ping Pong Balls. These balls come in assorted colors, including red, pink, yellow, blue, purple, and more. There is a random color variety in each pack – each pack comes with 50 balls in total. The balls were decided to provide little bounce, making them a more appropriate solution if you are only going to use the balls for beer ping. These balls measure 40mm in size. The best professional ping pong balls for beer pong on the market for anyone who is looking to be serious about the game, but still avoid paying too much, is the Sportly Beer Pong Balls pack. The pack comes with a total of 144 balls and will set you back less than $12. You can choose between a standard pack of white balls, or rather mix things up with a colored pack. These balls offer limited bounce to make them more ideal for beer pong, and measures 38mm in size. They are appropriate not only for beer ping, but also for additional uses like table tennis and ping pong. We found the best orange ping pong balls for beer pong to be the STIGA 3 Star Superior Quality Orange Table Tennis Balls pack. This pack comes with six balls and is a little more expensive than the other options we have mentioned, but each ball was made to provide you with maximum durability. The orange color makes these balls great for playing beer pong on tables with a very light surface. The fact that these are three-star balls also means you can use them for additional purposes, such as to play a game of table tennis with a friend. After a lot of research and consideration, we consider the SportzGo Beer Pong Plastic Balls set to be one of the worst ping pong balls for beer pong on the market. This is a cheaply made set of beer pong balls. Sure, buying a pack of 48 balls for under $8 might seem like a good idea, but their quality is nowhere near what you get when you decide to invest just a couple of dollars more. These balls measure 38mm in size, and they only come in a white color. The overall construction is poorly made in such a way that the balls are not as durable as the other options that we have listed for you in this post. Even though promoted as beer pong balls, the manufacturer also has a large focus on promoting this set of balls as accessories for arts and craft projects, instead of solely focusing on making quality balls to be used in beer pong games. While buying ping pong balls for a game of beer pong may seem like a pretty straightforward task, you will notice that there are hundreds of different options to choose from. You can opt for a standard set of table tennis balls and then there are brands that have developed specialty beer pong balls. It can be very hard to understand which of these options will work best for you. To make things easier, we have developed a system where we take specific points into consideration when we look at the beer pong balls that are available on the market – this is how we were able to come up with a list of the best options that you can buy right now. If you are looking through the various options that are available, be sure to take into account the three main points that we discuss below. This way, you are more likely to end up with a set of balls that will be to your liking during a game of beer pong. Quality: We highly recommend that you start by considering the quality of the balls that you might be looking to buy. The quality of these balls tends to vary from one brand to the other, and even sometimes between different sets that are manufactured by the same brand. One way to determine the quality of beer pong balls is to consider the stars that are printed on the ball. Not all of these balls will come with printed stars – when stars are not printed on the ball, consider the name of the set and the packages. You will sometimes see that the manufacturer refers to the balls as one-star or three-star balls. A three-star ball is considered to be of higher quality than a one-star ball, but this may set you back more than the other option. In addition to considering the stars, also take a look at the brand that manufactures the balls. Some brands are better known for the quality of their products than others – if you find such a brand, then you will know for sure that you are about to buy a set of beer pong balls that will likely last a significant amount of time and provide a more durable performance during your beer pong games. Price: It is also a good idea to take into account the price of the balls that you are interested in – do not simply hit the buy or add to cart button without knowing exactly what you are paying for. You should also try to ensure that you get the best deal on a specific set of beer pong balls. For this point, you will most likely have to do some research. If you know how much money you have available to spend on the set of balls before you start your search, then this will make things easier as well. You will be able to set up appropriate filters so that the only sets displayed to you are those that fit within your budget. Apart from taking your own budget into account, you should not be too quick to buy a product when it seems like a good deal. Compare different sets of beer pong balls in order to find the option that will be the most affordable one for you – consider the price and quality of each, and how good they will be in your beer pong game nights. You will sometimes find that two suppliers are selling an identical set of beer pong balls at different prices. In such a case, you can often save a lot of money by simply doing some research before making a final decision. Size: Another point that a lot of people miss is the size of the ping pong balls that you buy. Even though many people do tend to opt for table tennis balls, remember that you are not actually going to be using the balls to play table tennis. Instead, you will rather be using them to enjoy a game of beer pong with a couple of your friends. For this reason, size should be a crucial factor that you need to take into account when you decide which set of balls to buy. If you buy a set of balls that are too large, they will be more likely to make the beer cups fall over, and they will take up too much space in the cup as well, should a player successfully land the ball into the opponent’s cup. On the other side, you also do not want to buy beer pong or table tennis balls that are too small, as this will significantly increase the difficulty of landing a successful hit (except if you are trying to make the game more difficult). Consider your preferences in terms of playing beer pong and then decide on a ball size that is most appropriate to the game you wish to play. There are different types of ping pong balls on the market that you can choose from. Ping pong balls are usually standard table tennis balls. Even though many companies are developing specialty “beer pong balls,” these balls still follow similar principles and offer the same features as you would find when buying a set of table tennis balls. Thus, when it comes to considering the stars that are often printed on these balls, the same factors still apply. The most popular options that you are going to find include one-star ping pong balls and three-star ping pong balls. The stars are essentially used to describe the general quality of the balls that you are interested in buying. Balls that have a single star printed on them or mentioned “one-star” on the packages of the set are usually the lower quality options. You will find that one-star balls are usually much cheaper than other options since they are considered the lowest of the bunch. Now, on the other hand, three-star balls are those balls that are used in professional tournaments. These are the higher quality balls that are usually much sturdier than one-star balls, and they provide better durability. Thus, if you want to take your beer pong games more seriously, then you might want to consider investing in a set of three-star balls. On the other hand, if the quality of the balls you buy is not your primary concern here, then a set of one-star balls will do just fine. In addition to understanding that ping pong balls come in different types in terms of their stars, it should also be noted that different sizes are available as well. Due to the difference in size of these balls, some people may be confused and not entirely sure which option that should opt for. With beer pong, however, people have their own preferences in terms of how large the balls should be. It could be a good idea to try out a 38mm and a 40mm ball and see which works best for you. A lot of people do still opt for the 38mm option since the ball is a bit smaller, but without being too small. If you are looking to make the game a little easier, then choosing the slightly larger 40mm option might be a good idea. 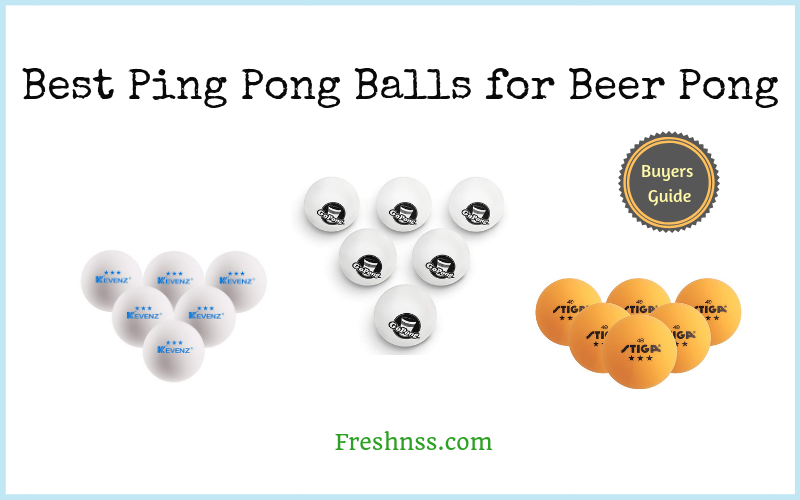 If you wish to play beer pong like the pros, then you need to make sure you buy the best ping pong balls for beer pong of 2019. Without the right balls, the game can become compromised, such as when your ping pong balls are too large. There are several factors that should be taken into account when it comes to buying ping pong balls that you will be using for your beer pong games. In this guide, we explained some important factors that you will need to take into consideration if you wish to buy a good set of ping pong balls for your beer pong games. Furthermore, we also provided you with an overview of the best options that are currently available on the market, making your search for the perfect set easier and faster. Simply take a look at what we have shown you here and then decide on the set of beer pong balls that best matches your preferences and budget.